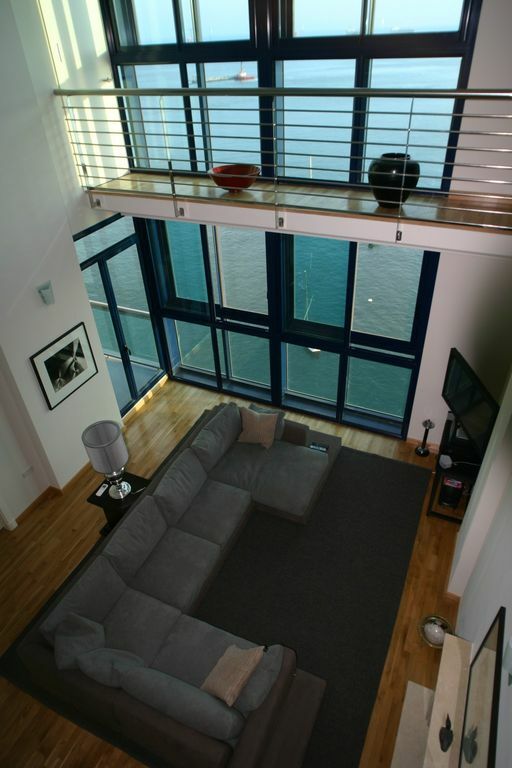 This property is situated in the Europort area by the sea in one of Gibraltar's recent luxury developments. The flat has stunning south westerly views all around to Spain, the Straights of Gibraltar, Africa and the Rock itself. This duplex apartment is built on two floors with a mezzanine overlooking a double height reception room. It comprises three double bedrooms and three bathrooms (one en suite), kitchen, dining room (seating 6-8), spacious living room, laundry room and large terrace. The property is fully air-conditioned, has high speed wifi internet and cable television. It is conveniently located very near to Morrisons supermarket and within 5 min walking distance to the town centre and Main Street and less than 2 km to the airport and the Spanish border. It is also within walking distance to most of Gibraltar's attractions such as Ocean Village, Queensway Marina, Kings Bastion Leisure Centre, the Cruiseship Terminal and Casemates Square. We do not offer long term rentals. Spain: Malaga Airport - 90 min drive by motorway (100 km). Seville - 2 hour drive by motorway (200 km). Jerez de la Frontera - 1 hour drive by motorway (110 km). Marbella - 45 min drive by motorway (80 km). Cadiz - 90 min drive by motorway (140 km). Tarifa (fast ferries to Morocco) - 30 min drive (40 km). Place was outstanding condition and idea for what we needed for the week. Apartment was fully furnished with everything required. The property met our every need and accommodated 6 of us easily with plenty of space. Absolutely stunning views. Close to everything we needed, walking distance to main street, casemates and cable cars. Fantastic customer service from George and Michelle. I am sure we will return (again!). Loved it. The apartment is superb with amazing views. Morrison’s store across the road, so no problems shopping. Buses to everywhere. So many interesting places to go to like the botanical gardens, museum and cable car. The TV is too clever for us old gits to manage without some stress, but another few days and we might have mastered it. Beds absolutely gorgeous. Microwave terrifying but did the job well. Thanks Val, I'm so glad you enjoyed it. I know what you mean about the TV, another example of how technology has made life more difficult in a way. I think I need to work on a more comprehensive "how to" manual when I'm there next. The microwave is indeed terrifying, many friends and family have said the same thing. But it's been a workhorse for 25 years and I'd be lost without it. We hope to welcome you again in the future. We can't fault this apartment! Well appointed, great views and brilliant location. We will definitely book this place again when we return to Gibraltar. This property is conveniently located next door to Morrisons supermarket and within 5 min walking distance to the town centre and Main Street and less than 2 km to Gibraltar Airport (GIB) and the Spanish border. It is also within walking distance to most of Gibraltar's attractions such as Ocean Village, Queensway Marina, Kings Bastion Leisure Centre, the cruise ship Terminal, Casemates Square, the cable car to the top of the Rock and it's famous monkeys. Gibraltar is near some of the best beaches and golf courses of the Costa del Sol. Malaga Airport is 100 km away and a 90 min drive. Valderrama, Alcaidesa Links, San Roque Club, Sotogrande Golf Club.